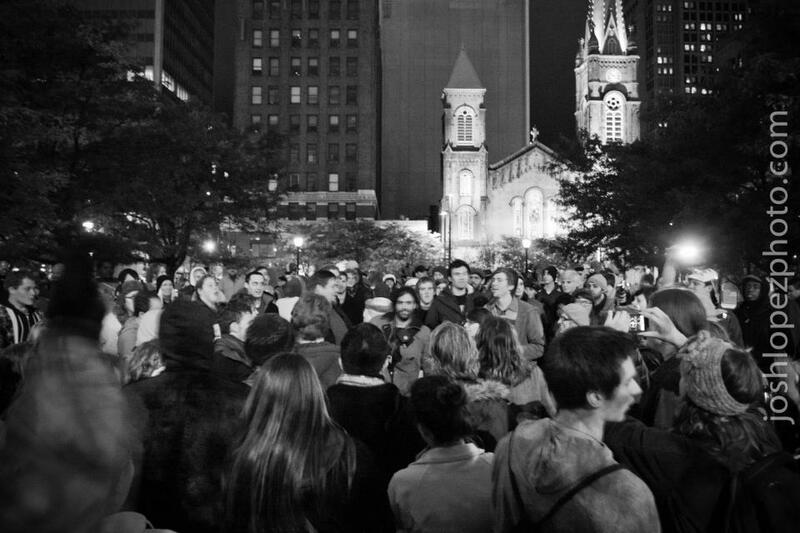 On Friday, November 11th 2011 (11/11/11), we took to the streets and made phone calls to President Simon. We set up shop outside the rock, the International Center, and the Hannah Administration Building from 11-1 and stopped passerbys, informing them of the dangers of our on-campus coal plant, and asking them to call President Simon to voice their concerns. Making these phone calls is not something unique to 11/11/11. We have been receiving a ton of support from student groups, community organizations, fellow students and students from other universities across the midwest. 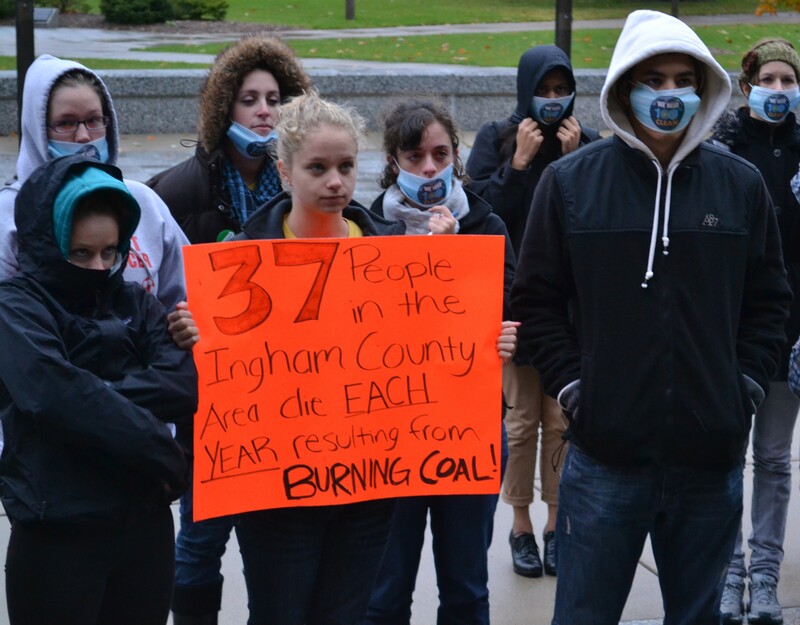 Coal is an issue that affects everyone, and now everyone is banding together to show their wish of MSU retiring the T.B. Simon coal-fired power plant and transitioning to renewable energy sources. We have been calling President Simon voicing our concerns for the last few weeks, and we will continue to do so until our voice is heard. We encourage all of you to call her as well. Her number is 517-355-6560. We are keeping track of every call made. So if you could track every call you make using this form it would be greatly appreciated. Thanks! It has been a couple of whirlwind weeks for MSU Beyond Coal, and everyone on campus has been pushing for a 100% renewable energy future! Lois Gibbs: Leading activist in the battle for Love Canal, Founder and Executive Director of the Center for Health, Environment, and Justice. After these incredibly knowledgeable and motivational speakers, about 300 of the students in attendance followed David Cobb to Occupy Cleveland to stand in solidarity with the movement until it was brought to a close by the police. This was a phenomenal opportunity for students to see that our movement reaches beyond our campus, and as always, beyond coal. Its is hard to think of anything more motivational than marching, chanting and singing in complete solidarity with so many people. Basically, sessions are specialized classes that we attended on environmental issues ranging from fracking for natural gas to listening to the tactics of other successful Campuses Beyond Coal campaigns. A more detailed description of what we learned, and what the MidWest thought of it, will be available shortly. One really big highlight from Saturday is all the new friends we made! MSU was networking like CRAZY. We met so many students from all over the MidWest who not only were familiar with our campaign, but were ready to jump in the fray with us. This attitude is something that will not soon be forgotten. Eyes all over the MidWest are on this campaign! This is serious responsibility, and we refuse to take it lightly. 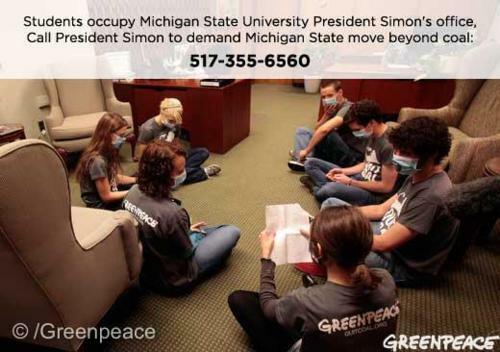 Before we left for PowerShift, 3 MSU Greenpeace members were arrested after a sit-in at President Simon’s office. This bold and powerful action launched a massive wave of momentum that we rode into AND out of Cleveland. Saturday evening, we were invited to stand on stage with Phil Radford, the Executive Director of Greenpeace as he praised our work so far, and demanded that we never stop fighting. It was both humbling, and electrifying to receive this type of support. While on stage he also continued our newest campaign tactic, calling President Simon’s Office and leaving a personal message urging her to commit to directing a no coal goal for MSU. His message was one of hundreds that PowerShifters left for President Simon. 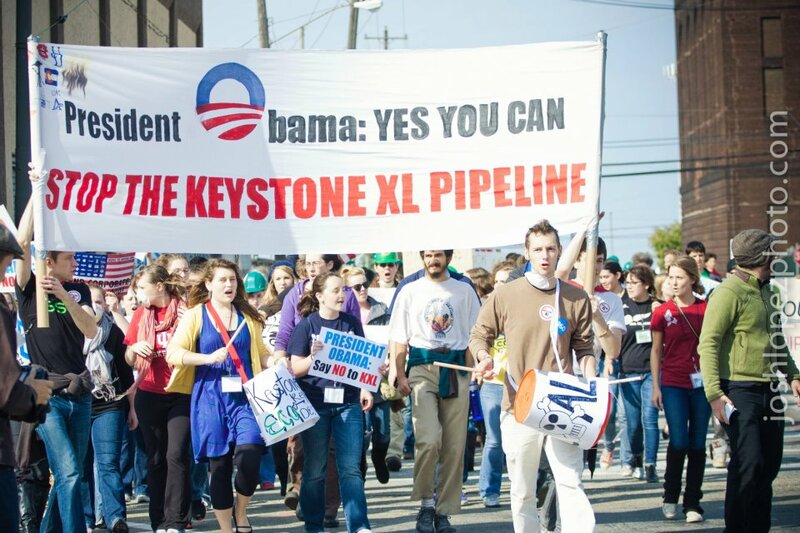 After a breakout focused on the environmental issues faced by our State, PowerShift mobilized! We marched around the city of Cleveland demonstrating against the Keystone XL Tar Sand pipeline that President Obama is due to authorize or deny this Friday, November 4th. Once again, Michigan State’s battle was highlighted in a stop in front of a local coal fired power plant. Much like Occupy Cleveland, the focus was on standing in solidarity, not only for the future of the planet (as if that’s not enough!) but for our lives right here, right now. 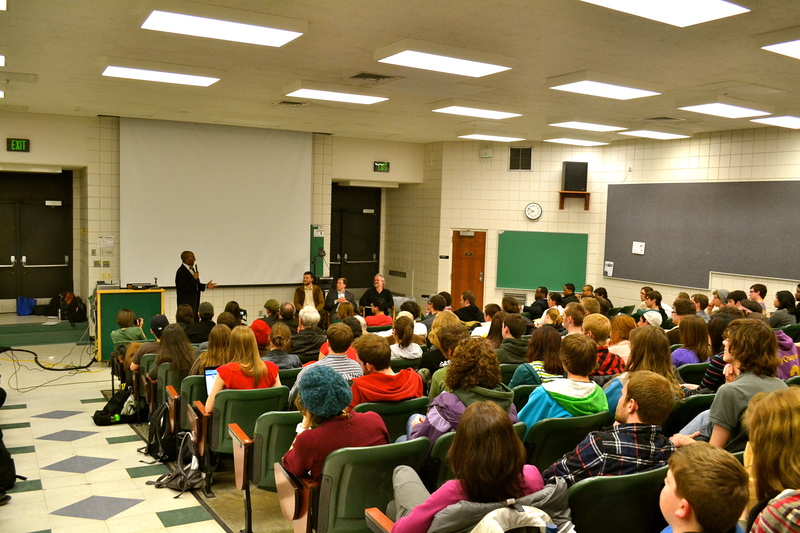 Just two weeks ago, two groundbreaking events were held by two of Michigan State’s environmental groups: MSU Beyond Coal and MSU Greenpeace. Since then, the nation has been alight with the issue of the T.B. Simon coal-fired power plant, the largest on-campus coal plant in the country. On Wednesday, October 19th, MSU Beyond Coal and MSU Greenpeace hosted a “Dirty Dancing Flash Mob for Clean Energy” in front of the Hannah Administration building. This flash mob was just one event in a much larger national month of action called “100% clean: 100 actions for clean energy” It was cold, windy and raining all day, and by the time 4 p.m. rolled around the weather had not lightened up at all, but that didn’t stop dozens of students from gathering before the steps of the administration building. To the tune of House of Pain’s “Jump Around,” students danced in the rain, their dancing symbolizing the “song and dance” that the administration wants the students to perform. However, as the song progressed, small groups of students began to stop dancing. They donned surgical masks with stickers reading “100% clean” across the front, and sat around a standing central figure who held a poster with coal-related health facts, symbolizing the refusal of the student body to participate in this “song and dance” any longer. MSU Beyond Coal president Talya Tavor set the mood with a slam poem about coal, the effects of coal, her story, and the role that the administration plays. She was followed by three incredible speakers; Nic Clark, the Michigan Campaigns Director of Clean Water Action; Robbie Richardson, a CARRS professor at MSU; and Douglas Jester, the former mayor of East Lansing and a senior consultant with 5 Lakes Energy. When the inspiring speakers finished, banners were unfurled revealing the phone numbers of a handful of administrators at MSU, including: Fred Poston, the Vice President of Finance and Operations; Lou Anna K. Simon, the President of MSU; and the MSU Board of Trustees. Adam Liter, the Vice President of MSU Greenpeace, made the first call to the President’s office demanding that she make a directive to the Steering Committee for 100% renewable energy on campus. All in all, dozens of students frustrated with the administrations lack of action, braved the harsh Michigan autumn weather to relay an important message to the administration. We students demand that our health be taken seriously and the university transition to 100% clean, renewable energy sources. We are sick of being sick! There is a nice, short article and video of the event in The State News. The next day, seven m embers of MSU Greenpeace marched up the steps of the administration again, wearing the same surgical masks. But this time they sat in the lobby of President Simon’s office and proceeded to read the hundreds of names off of the petitions they collected over the past year. Each name was a student who demanded that the university transition to 100% clean, renewable energy and retire the T.B. Simon coal plant. For two years now, students have been actively voicing their concerns about the coal plant, and still the administration does not seem to take these concerns seriously. Since the student demands were not being met from afar, these students decided to take their concerns directly to President Simon. The Hannah Administration building closes at 5 p.m.. At that time, the police asked the students to leave. Four of them did. Not because of intimidation, but because that had been the plan. Three members (Peter Rustad, Adam Liter and Kendra Majewski) stayed, and were arrested for trespassing. This amazing video by Greenpeace describes the event further. We, members of Beyond Coal, members of Greenpeace, and the student body in general, have been trying to make our voices heard. We’ve set up meetings. We’ve called. We’ve gathered petitions. We’ve rallied. Members of Greenpeace have taken the concerns of the student body directly to President Simon’s office. Still our concerns are not being heard by the administration. But after last Thursday’s sit-in, our concerns are being heard elsewhere. The State News, the Lansing State Journal, Michigan Messenger, mlive, The Oakland Press, The Chicago Tribune, Channel 4 News in Detroit, and many other news sources and blogs covered the event. The events of this week caused a stir across the nation, and the momentum from it followed us and carried us through MidWest Powershift 2011. Over 175 people turned out to hear the speakers and show their support at the forum on Thursday, March 31st 2011. As a freshman at a Michigan State, it is all too easy to get lost in the crowd. Luckily for me I found the group Beyond Coal, sponsored by the Sierra Student Coalition. I can comfortably say that joining Beyond Coal and attending the 2011 Clean Energy Forum on Thursday, March 31st have easily paid back the highest dividends of my freshman year. Professor Sean Huberty, lead faculty of Lansing Community College Alternative Energy Engineering Technology Program, spoke about investing in building efficiency NOW to afford major savings later. He encouraged MSU to undergo a redesign and retrofit process for existing buildings, and identified a need at MSU for more educational opportunities in green energy and efficient building and design. It is already feasible and affordable to convert our economy entirely to renewable, low-polluting energy sources, but there is work to be done to optimize such an energy system and improve the technologies. Michigan State University is an ideal place to do that work, demonstrate it to others, and educate the people who can do it for our whole society. And, he stressed, though we still need to learn and improve these clean energy technologies, we learn best by doing and at MSU we cannot afford to wait any longer. Mike Johnson, senior coal analyst with Greenpeace USA, spoke perhaps most directly about the possibilities in a clean energy future for MSU. He outlined in his powerpoint entitled “Bold Times, Bold Responses” that one of the foremost objectives for MSU’s transition should be should be cost effective, long-term strategies that meets energy needs of growing research. He was very clear that there would be no “silver bullet” for campus, but that it is possible for MSU to be aggressive in moving towards a 100% renewable energy future. D. Alexander Bullock, president of Greenation, spoke from the heart, appealing to the activists in the room. He worked with a new definition of freedom, claiming a freedom TO instead of the freedom FROM that American history is so accustomed to. He spoke about a need to view the movement towards a global clean future as culture war: sighting that the only way to get something done is to be fully invested and active. The panel then answered direct questions from the audience: ranging from the personal, to the hypothetical. In ending, of course it was fitting to ask what thought, ideal, or point of hope each panelist wished that the audience would walk out remembering. The answer was to continue to fight, continue to educate and recruit students, and to learn through action. What I’ve learned is this: one person in a million won’t be able to give the world the clean energy future it deserves; instead millions must focus and relentlessly pursue it as one. Michigan State students deserve a healthy, prosperous coal-free future, but this will not happen without true activism on campus. It’s time President Simon embrace this effort, so that MSU students can graduate and lead the rest of the world towards the clean energy future we deserve. This will not be an easy journey, but transitioning off of coal to 100% renewable energy on campus is possible. And it is crucial that MSU take bold action immediately to put us on the right course. By Friday, April 22nd, this Earth Day, publically announce a commitment from Michigan State to move off coal and provide an ambitious timeline to transition to 100% renewable energy. We know you have the leadership; we are calling on you to make this announcement by Earth Day, and eagerly await your response. “This long overdue and relatively modest air quality update by Administrator Lisa Jackson and the EPA will save lives, prevent disease and help college students avoid costly hospitalizations and missed schooldays. The air toxics safeguard announced today will protect Americans from breathing some of the most dangerous and toxic pollutants known to us – arsenic, acid gases, lead and mercury. Even in small amounts, these life-threatening air pollutants are linked to cancer, birth defects, brain damage, respiratory disease and even early death. Without this critical update, millions of tons of air toxics will continue to be released into our air each year. Corporate polluters are making us sick. To protect our health and our future, the EPA should forge ahead on this safeguard and stand their ground against polluters who continue to fight pollution protections for the sake of their profits. For more information, visit www.sierraclub.org/stoppolluters.